Today is the anniversary of Alexander Fleming's discovery of penicillin, in 1928. "Antibiotics" have been known for centuries - the ancient Egyptians had the practice of applying a poutine of moldy bread to infected wounds. So what did Fleming do that distinguished him as the discoverer? He systematically investigated the rare strain of Penicillium notatum found in his lab. AND he published his findings in 1929. He had "only a passing reference to penicillin's potential therapeutic benefits" but that publication was the deciding factor. The work that followed dwarfs his contribution - both the amount of work and the scientific discoveries and advancements needed. The key scientists that made this happen were Howard Florey and Ernst Chain. They isolated it and purified it - during the initial wartime period when work was difficult. They grew the mold in all kinds of culture vessels - milk churns, food tins, baths, etc. The scientist who wasn't acknowledged for his contribution was Norman Heatley. He and Edward Abraham were involved in creating the methods to extract penicillin using various techniques, and then removing impurities. The milestone case came along - a 43-year old policeman had scratched the side of his mouth while pruning roses, and developed a life-threatening infection - penicillin was injected and he made a remarkable recovery. BUT - supplies ran out, and he died a few days later. The scientific challenge was to create supplies to fulfill treatment and to complete extensive clinical trials. This increase in production was done in the U.S. There were numerous discoveries - for example, the substitution of lactose for the sucrose used by the Oxford team in their culture medium. Soon a global search was underway for better penicillin producing strains. Soil samples were sent to the lab from around the world. The most productive strain came from a moldy cantaloupe at a Peoria fruit market. Norman Heatley stayed in Peoria to help the staff get the penicillin work started and Howard Florey visited various pharmaceutical companies to try to interest them in the drug. They were convinced to work on creating enough penicillin to treat patients. There were many hurdles in production. They succeeded. By 1949, the annual production of penicillin in the United States was 133,229 billion units, and the price had dropped from twenty dollars per 100,000 units in 1943 to less than ten cents. "Ironically, Fleming did little work on penicillin after his initial observations in 1928. Beginning in 1941, after news reporters began to cover the early trials of the antibiotic on people, the unprepossessing and gentle Fleming was lionized as the discoverer of penicillin. And much to the quiet consternation of Florey, the Oxford group’s contributions were virtually ignored. That problem was partially corrected in 1945, when Fleming, Florey, and Chain — but not Heatley — were awarded the Nobel Prize in Physiology or Medicine. In his acceptance speech, Fleming presciently warned that the overuse of penicillin might lead to bacterial resistance. In 1990, Oxford made up for the Nobel committee’s oversight by awarding Heatley the first honorary doctorate of medicine in its 800-year history. Maybe this September 28, as we celebrate Alexander Fleming’s great accomplishment, we will recall that penicillin also required the midwifery of Florey, Chain and Heatley, as well as an army of laboratory workers." "In 1928, at St. Mary's Hospital, London, Alexander Fleming discovered penicillin. This discovery led to the introduction of antibiotics that greatly reduced the number of deaths from infection. Howard W. Florey, at the University of Oxford working with Ernst B. Chain, Norman G. Heatley and Edward P. Abraham, successfully took penicillin from the laboratory to the clinic as a medical treatment in 1941. The large-scale development of penicillin was undertaken in the United States of America during the 1939-1945 World War, led by scientists and engineers at the Northern Regional Research Laboratory of the US Department of Agriculture, Abbott Laboratories, Lederle Laboratories, Merck & Co., Inc., Chas. Pfizer & Co. Inc., and E.R. Squibb & Sons. The discovery and development of penicillin was a milestone in twentieth century pharmaceutical chemistry." 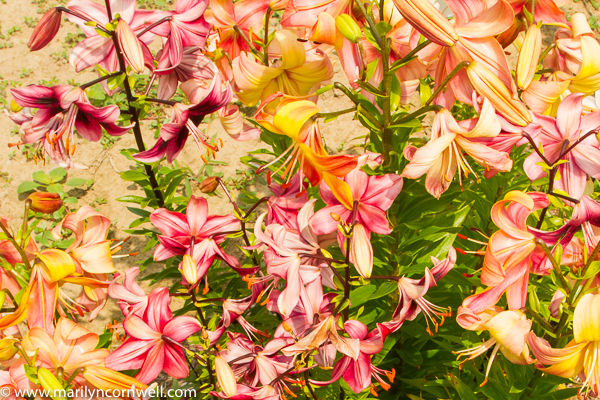 Our picture today - a group of lily hybrids in Brian's Lilycrest hybridizing field.